Lepromatous leprosy is a multisystem disease that develops in individuals with decreased cell mediated immune response against mycobacterium leprae. Lepromatous leprosy with palatal perforation is a rare presentation and if the patient is left untreated, it causes massive multiplication of Mycobacteria leprae that infiltrate the skin, nerves, eyes, upper respiratory tract, reticuloendothelial system, testes, adrenals, oral cavity and other viscera. We hereby report this case in a female suffering from lepromatous leprosy with complications of palatal perforation and lost central incisor teeth simultaneously. Hansen's disease (leprosy) is caused by a chronic granulomatous infection of the skin and peripheral nerves with Mycobacterium leprae (M. leprae). It is an obligate, slow growing intracellular parasite that grows best at 27°-30°C, which is consistent with the characteristic major target organs of the disease in humans as the skin, peripheral nerves, nasal mucosa, upper respiratory tract, and eyes. It may also involve mouth, the reticuloendothelial system, eyes, bones, testis, liver and kidney. Leprosy is still a social stigma. It is common in population where poor living conditions, overcrowding and malnutrition exists. The disease clinically presents in two immunological polar ends as tuberculoid and lepromatous and is a result of variation in the cellular immune response to the mycobacterium. Lepromatous leprosy is a multisystem disease that develops in individuals with decreased cell mediated immune response against mycobacterium leprae. This is an infectious form of leprosy and large number of bacilli is discharged from upper respiratory tract. Various types of lesions observed are infiltration, ulceration, perforation, reddish or yellow reddish nodules, sessile or pedunculated, varying from 2 to 10 mm, some confluent and prone to ulceration. Thirty- five years old Indian female from Adilabad, presented with a history of multiple asymptomatic reddish raised skin lesions over the upper limbs, lower limbs, trunk, back and face of one year duration and hole in the hard palate of 4 months duration. She had no past history of similar skin lesions , no history of fever, joint pains or epistaxis. There was no history of similar complaints in family members. Skin examination revealed multiple erythematous nontender nodules of size ranging from 1.5cm x 2.5 cm, bilaterally symmetrical over both upper limbs, lower limbs, trunk, back and face (Fig.1 ,2). There was hypoesthesia in the hands and feet i.e. glove and stocking area for temperature, touch and pain sensations after testing with hot and cold water, cotton wool and pin prick respectively. Bilateral ulnar and lateral popliteal nerves were thickened. Eye examination was normal. 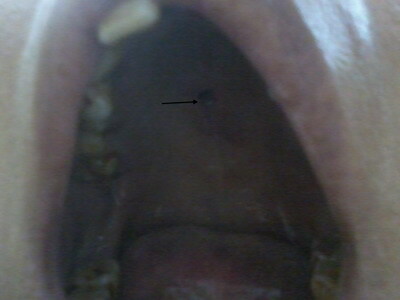 She had palatal perforation on the hard palate of size 2 cm x 1 cm which lead to regurgitation of fluids and food through the nose while swallowing (Fig.3). She also gave history of lost upper central incisor teeth one year back (Fig.4). She did not give any history of trauma or fall. Dental call revealed leprosy as a cause of loss of teeth. Slit skin smear examination from routine sites and nodular lesions was positive with bacterial index of 4.8. Skin biopsy from the nodule showed lepromatous leprosy but biopsy from hard palate could not be done as patient refused for a second biopsy. 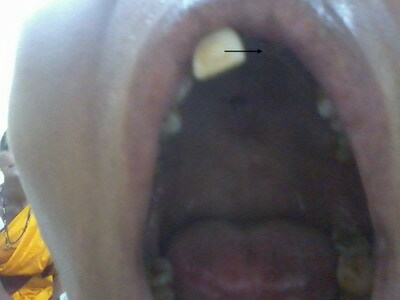 Thus the diagnosis of lepromatous leprosy with lost upper central incisor teeth and palatal perforation was made. She was treated multibacillary treatment consisting of Cap Rifampicin 600 mg. and cap Clofazimine 300 mg once a month with Tablet Dapsone 100 mg and Cap Clofazimine 50 mg daily for one year respectively and she was advised regular follow-up. Involvement of oral cavity in leprosy is less frequent than that of nasal & nasopharyngeal cavities. Nevertheless, lesions of the mouth and palate are often found in patients of the Virchowian group . The distribution of the oral lesions has been attributable to the preference of the lepra bacilli to temperature below 370 C .
As the palate is a structure crossed by two air currents, the nasal and the oral, its temperature remains 1-20 C below the body temperature , which explains the location of palatal lesions in the midline.The difference in the progress of leprosy and the incidence of oral and facial lesions are also due to climatic, geographic and racial factors as well as the time of the disease onset and the duration of antileprosy therapy. We report this case as usually oral examination can be missed in a leprosy patient but it is important to examine the oral cavity in all leprosy cases as such findings can be easily missed if the patient is unaware of such occurrence. In our patient not only palatal perforation but loss of upper central incisor teeth was simultaneously present. Oral hygiene should be taken care in leprosy cases because detection and treatment of oral lesions can prevent the spread of the disease. 10. Costa A, Nery J, Oliveira M, Cuzzi T, Silva M. Oral lesions in leprosy. Indian J Dermatol Venereol Leprol. 2003 Nov-Dec;69(6):381-5.